I enlisted in the Navy V-6 (Combat Aircrew) program on July 12, 1944 [rather than being drafted] at Kansas City, MO., as an E-2, [having a High School Diploma] and attended Boot Camp at NTTC (Naval Technical Training Center) NAS Jacksonville, FL. Service # 343-12-16; Aviation Ordnance “A” School at NTTC Millington, TN. ; Aerial Gunnery school at “Yellow water”[near Cecil Field] then Radar Bombardier training at NAS Banana River, FL in SNB and PBY-5A aircraft; PBM Combat Aircrew (CAC) operational training at the same station then transferred to VPB-99 at Alameda, CA arriving there we learned that the squadron had been disestablished and after a week of mustering at 1000 each day and going back on liberty, was transferred to VPB-98 San Diego. We were all completely broke after seeing the sights of San Francisco for that week. After a couple of weeks in ground school which included 50 Cal. Machinegun live firing at Border Field, all the reserves were pulled out of flight status and after a stint at NAAS Brown Field in the Station Ordnance gang working on SB2C 20MM’s was transferred to NAAS El Centro, CA to stand guard duty on the closed down gunnery range and the still active ammo storage area. I was sent to Terminal Island, San Pedro, CA for discharge in Aug 1946. I signed up in the inactive reserves for 4 years. No drills or other activity required, it was just that you would get longevity if and when you were called back. I went to Reedley College in Reedley, CA Aug 46 to Dec 48. I joined the NAVCAD program at ONOP San Francisco in December and departed for NAS Pensacola, FL in March 49 for preflight class 6-49. I flew the SNJ at South Whiting Field, Corry Field and Saufley Field before going to Cabaniss Field , Texas for advanced training in the AD-1 and returned to Corry Field for Carrier Qualification before receiving my Wings and Commission on October 4th 1950 Naval Aviator (heavier than air) # T964. I next went to FAWTULANT at Key West for night-fighter training in the SNB and F6F5N. Upon completion of night-fighter training I received orders to Carrier Air Group Three (CVG 3), Sanford FL., for further transfer (FFT) to VF-31. This was quite upsetting to the XO that I would not be in Night-fighters and I got a real lecture. His request for “clarification” from BUPERS was “Execute as Written” [which really helped. Yeah right!] So I proceeded on schedule to Sanford and waited for VF-31 to arrive from Quonset Point, RI just after their return from Korea. I flew the F9F-2 [ditched an F9F and was picked up by an HO3S Helicopter] and F2H-2 on two MED cruses. I also qualified in the F2H-3, [went to 50,000′ and did a split-S, started recovery at 20,000’and was level at 10,000] then went to the training command at Pensacola Oct 53, South Whiting and Saufley Field instructing in the SNJ and T-28. I had over 1800 hours in the back seat of the SNJ and some additional time in the T-28 by the time I left in Oct 56 for helicopter training at Ellyson Field. 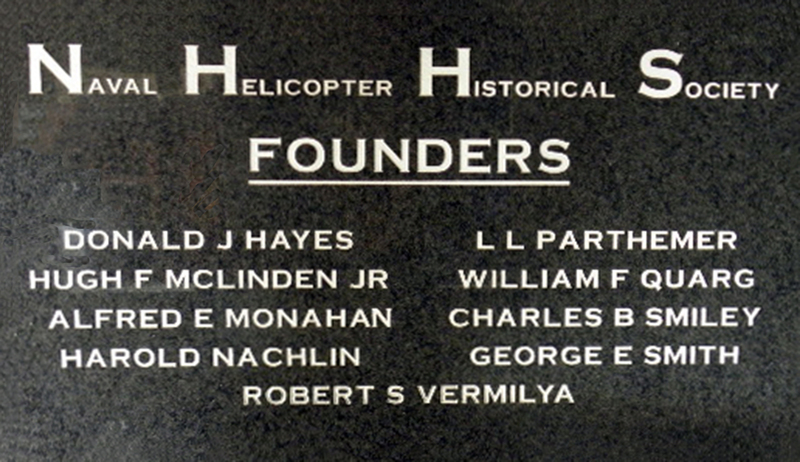 I received helicopter Pilot designation # 3271 on 7 January 1957 and departed for HU-1 at Ream Field San Diego, CA. In April I was sent to detachment one Oppama Japan to become the OinC of the 7th Fleet Flag Ship [USS Helena CA-75] helo detachment flying the HUP-2 returning to Ream Field in October. I attended Aviation Safety School at USC in Los Angeles and became the squadron safety office. In January 1959 I reported to COMUTWINCPAC Staff as assistant Ops and safety officer at Brown Field. March 1961 reported to NPGS Monterey for the Bachelor of Science Program; April 1963 reported to Commanding Officer NAS Lemoore as the aviation safety officer; October 1964 FAETU / HS-1; HS-9 March 65 – Dec 66. 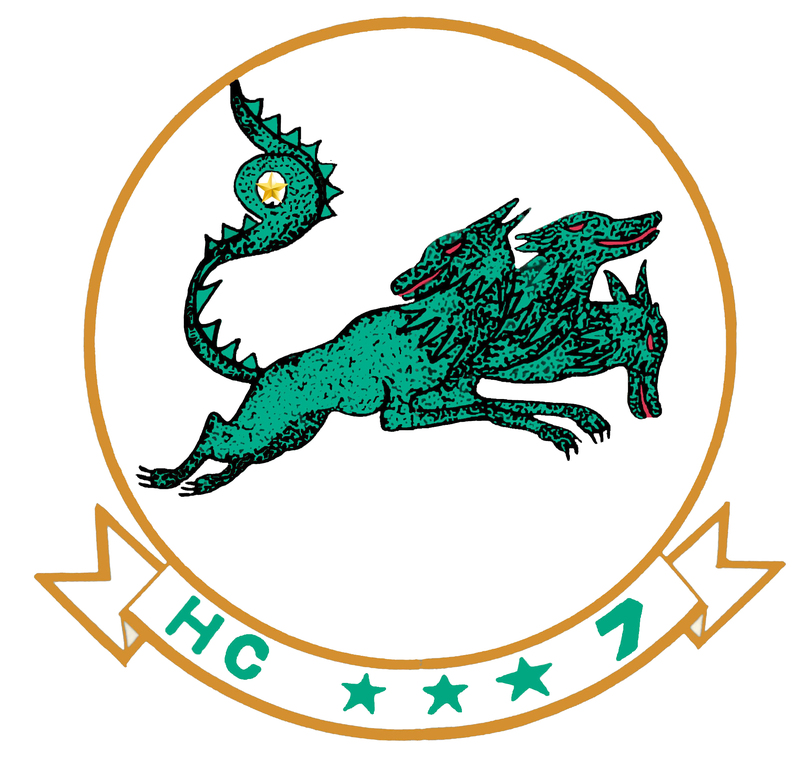 HC-1 as XO JAN 67 – Aug 67; HELSUPPRON SEVEN (HC-7) Sept 67 – Sept 68 as First Commanding Officer of the first helo squadron tasked specifically with Combat Search and Rescue (CSAR). 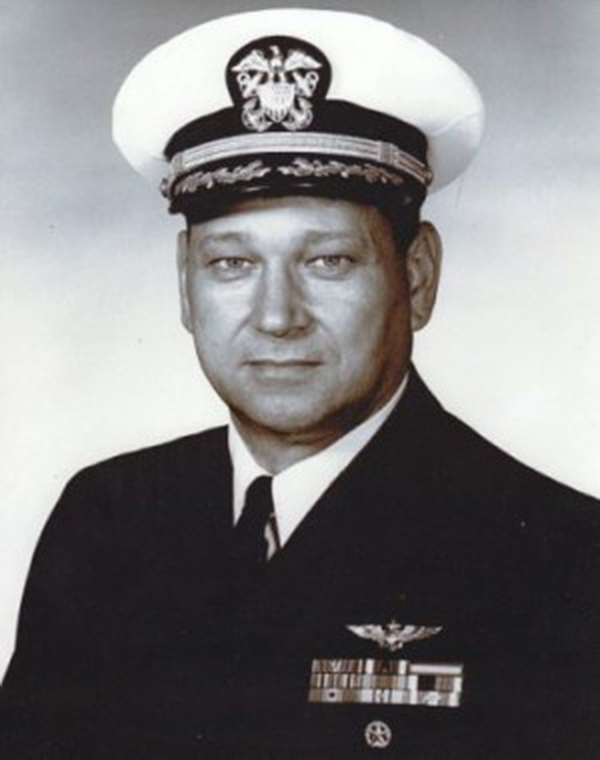 Reported to the PCO USS New Orleans (LPH-11) in Philadelphia Naval shipyard as OPS Officer in Oct 68; Attended the MOH ceremony at the White House when LT Clyde E. Lassen was presented the Medal of Honor by President Johnson. COMNAVAIRPAC STAFF code 81 Oct 70 – Jun 72; NAS Imperial Beach XO Jun 72 RETIRED Sept 1975. I am authorized to wear the BRONZE STAR W/CONBAT V; NAVY COMMENDATION MEDAL; PRESIDENTIAL UNIT COMMENDATION; AMERICAN CAMPAIGN MEDAL; WWII VICTORY MEDAL; OCCUPATION MEDAL; NATIONAL DEFENSE MEDAL W/BRONZE STAR; VIETNM SERVICE MEDAL W/BRONZE STAR AND VIETNAM CAMPAIGN MEDAL REPUBLIC OF VIETNAM. There are at least a million stories contained in the years noted above. I have spoken to CNO (VERN C) face to face on at least three occasions socially. I piloted the PBY in 1944 when I was a seaman second class in boot camp at NAS Jacksonville, FL. LTJG Bob Carlin was a flight instructor in the PBY as he was a senior in 1941 when I started High School. He entered the Navy upon graduation and I entered the Navy approximately 3 years later upon my graduation from Frankfort High School. We met one day on the sidewalk in the boot camp area of NAS Jacksonville. I saluted him as an officer then we shook hands as we were well acquainted having spent a year together in High School and lived on farms not far apart. He asked me what was I doing on Sunday. I replied, “whatever they tell me”. He then said, “well get permission and come to the wardroom in building [I don’t remember the number] and then we will go flying. He added “oh, and bring a buddy with you. Bill O ‘Riley from Columbus Ohio was with me in boots so, I invited him. However, to this day I don’t remember getting permission from anyone. We did go to the Wardroom and had breakfast then got in a vehicle and went to the flight line and boarded the aircraft. It was lowered down the ramp into the Indian River, then the engines were started and we got airborne. 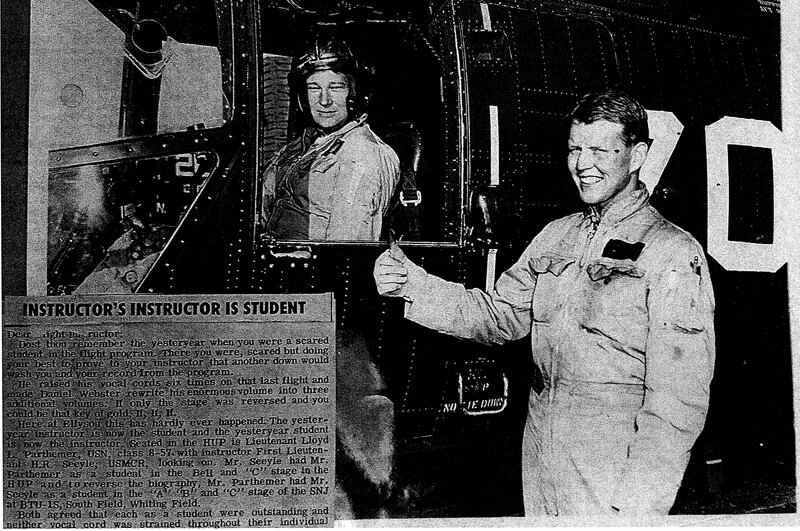 Bob had about four student pilots to run through the cockpit. He accomplished that fairly quickly then I got in the seat at the controls and drove the acft around for 30 minutes or so then he took it down for some water landings on the river. I was thoroughly on cloud nine at that point. Then he did the same for my buddy Bill. Other than helping an Army aviator, when I was in High School and at noon time five of us riding around in a car noticed two Army Bi-planes circling southwest of town and then landing in a stubble field there. One pilot shut his plane’s engine off and got out to ask us where is Fort Riley from here. we told him to follow the Vermilion river, which was right south of where they were, to the west to where it joins the Big Blue River then follow that south until you see the highway then turn West and you should be able to see fort Riley. The pilot then asked me to get in the rear cockpit of his plane and help him start the engine. He showed me the Mag switch and throttle and told me to turn the mag switch on when he told me to an also move the throttle to make sure the engine started. He then got the crank out and put it in the inertia starter and wound it up real good then took the crank out and pulled the T” handle to engage the starter to the engine and hollered to me to turn the mags on and move the throttle. I put on a little too much throttle but brought it back to idle and was holding the brakes and control stick in the cockpit. He then climbed into the front cockpit and waived me out of the rear cockpit. All went well and they both took off and started following the directions they had received. Never heard a thing from or about them so presume they got there ok.
That was the extent of me and real airplanes until I got to boot camp. I did build a few models but only one from a balsa kit. The usual thing was a 2″X4″ piece of wood and a thin board off an orange crate for the wing. I carved propellers and put on the front of the chunk of wood then head it into the wind, that was it. Flight 19, the loss of 5 TBF’s on the night of 5 December 1945 turned a planned flight of 4 hours into one of 11.8 hours. I was the second ordnance man on a PBM5 Buno. 59173 with plane commander, Bammerlin with 4 other pilots conducted a very interesting flight but no positive results of finding anything. There was also the loss of a PBM w/all the crew during the searching that night. I may be the only remaining live person who participated in the search that night. I have a lot of the details of the flight but have not compiled them as yet.